My little family has been blessed with the opportunity to move around a bit and live in and explore other countries. While I am now residing in Colorado, where my husband and I plan to retire, we recently moved from Fetcham, England, where we had been living for five years. While in England, I discovered one of my favorite diversions was browsing antique fairs and hanging out in auction rooms. There is a regular antique fair held at the Epsom Downs Racecourse, just up the road from where we used to live. The last time I was there, my crafty friend Pam and I stumbled across a young man selling all kinds of vintage office supplies and furniture odds and ends. 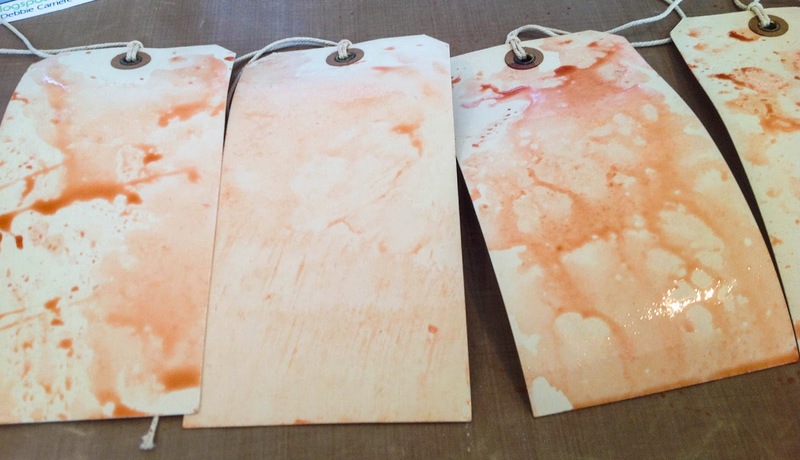 He had stacks and stacks of manilla-style tags, which he said were from the 1950s. Well, paper crafters LOVE to use tags, and Pam and I almost bought out his entire collection. 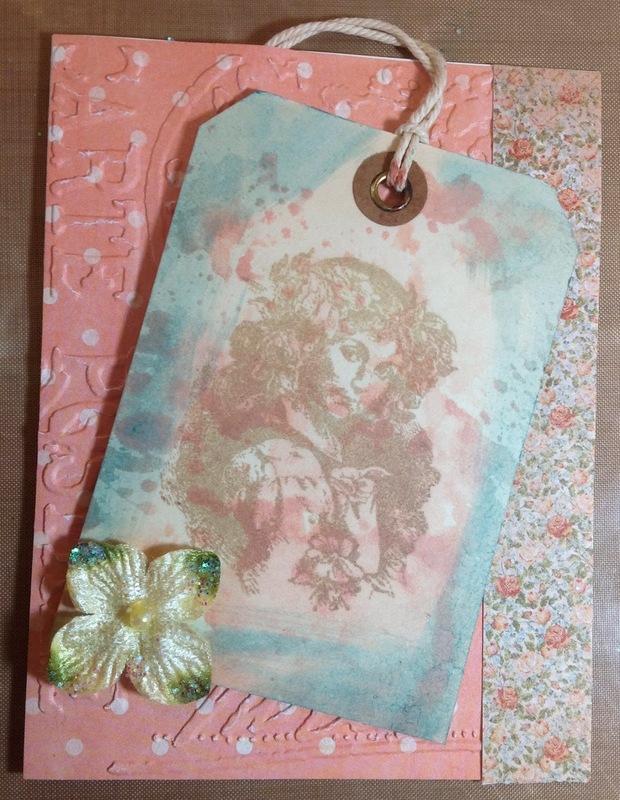 I finally have put some of these tags to use on this 'vintage lady' card. I thought: vintage lady, vintage tags! And I set out to distress and age the tags even more. 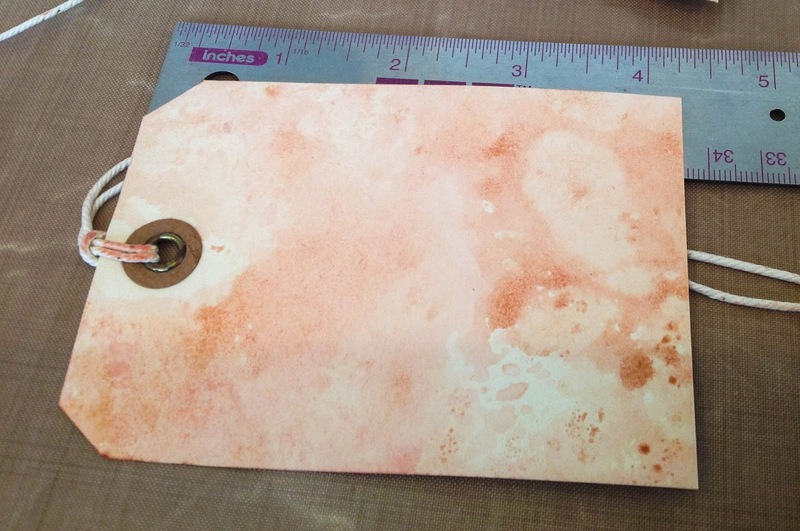 First of all, I dropped some of Tim Holtz Tattered Rose Distress Reinker onto the waterproof craft sheet. 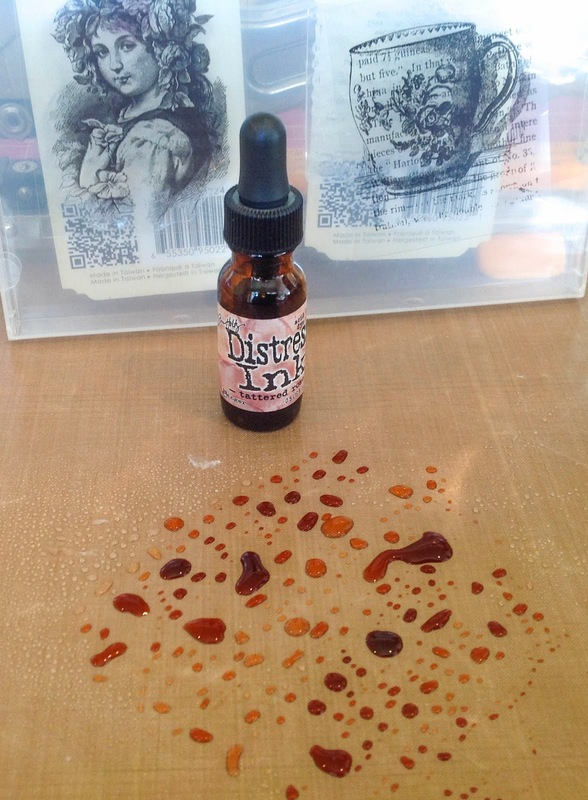 Then I sprayed some water to dilute the solution and then mix and spread the solution around on the craft sheet. 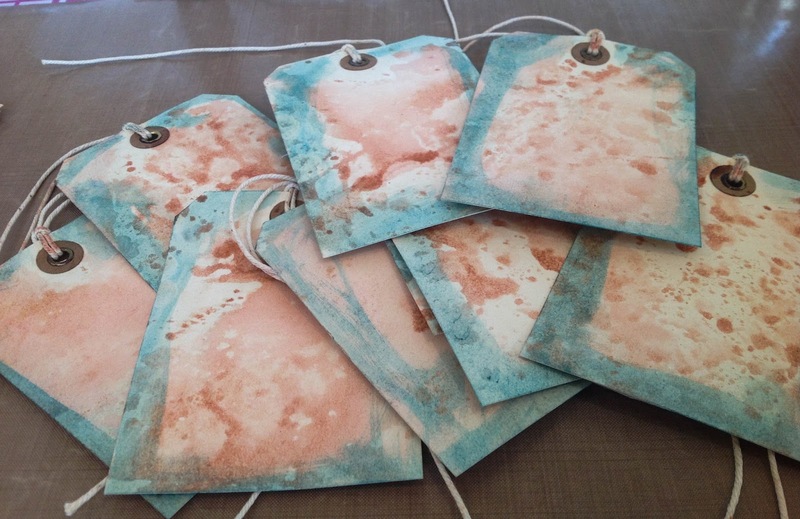 I then laid the tags onto the wet mess to distress the tags. Once they were mostly dry, I cut the tags to a length of 4.25 inches, so that they be the right size for a standard 4.25 x 5.5 inch card. The next step was to apply Broken China Distress Stain to the edges. 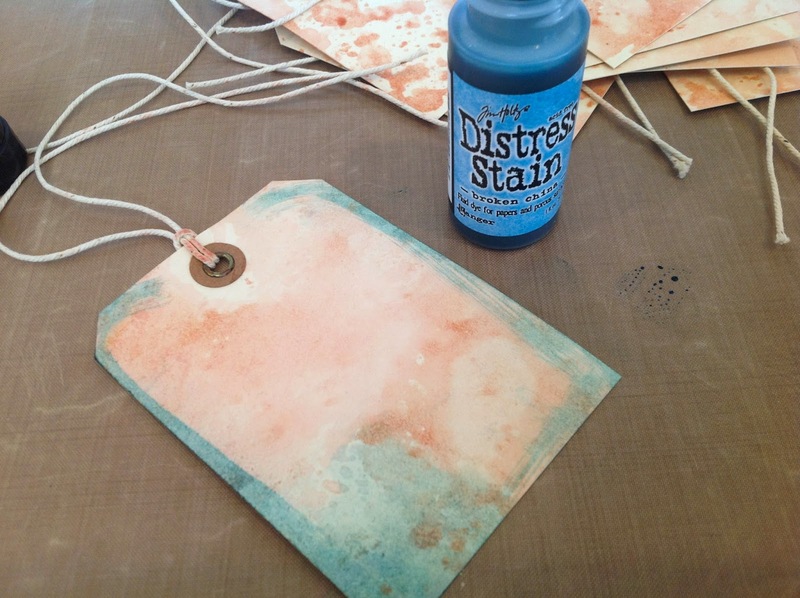 The stains have a nice spongy applicator, which worked perfectly to drag around the tag. I used my sophisticated tool, better known as my index finger, to smudge and spread the blue ink even more. You can see from the images that you are trying to create a frame of blue. Once the tags were dry, I used a stamp of a vintage lady and inked it in brown, which created a more subtle image than using black. 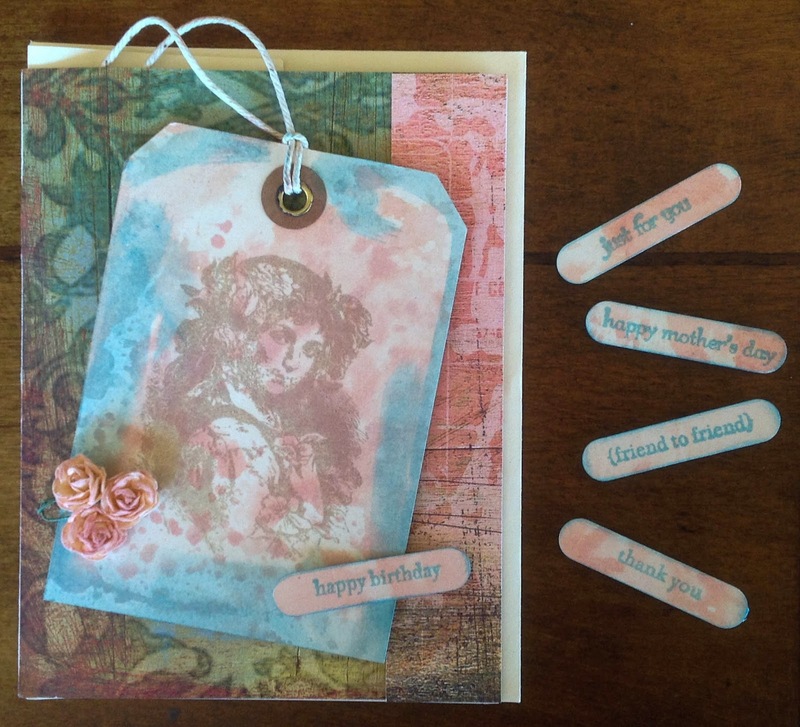 I played around with a variety of background papers, embossing folders, and flowers to finish the card. I made about eight versions of this card, and I often like to keep my sentiment labels separate until I know how I will use the cards. There is nothing more frustrating when you have a perfect card for a friend's birthday, but you've already stuck on a 'thank you' label. This way, I'm always ready to go and pop just the right card into the mail. Love your card Kathy, lovely colours!! I've followed you blog for quite some time, through your stops in vairous countries. How exciting to hear you are in Colorado. I live in the Denver area, love it!